And here he is looking like a man (with his siblings)!! Since he is a HUGE video game fan, I knew this card in the Silhouette Store was PERFECT! Greetings all from VA Beach! I used Gina K Designs card stock in Cherry Red and Kraft, stamps from Gina K Designs called True Love. Inks are Memento Tuxedo Black and Festive Berries by Tim Holtz. I used the Swiss Dots Cuttlebug embossing folder. Gems are from Archivers. Ribbon is from my stash. I’d love it if you’d check out my blog at http://cardsbyregina.blogspot.com. I am excited to be a guest designer on Jennifer’s blog today. Thanks Jennifer! 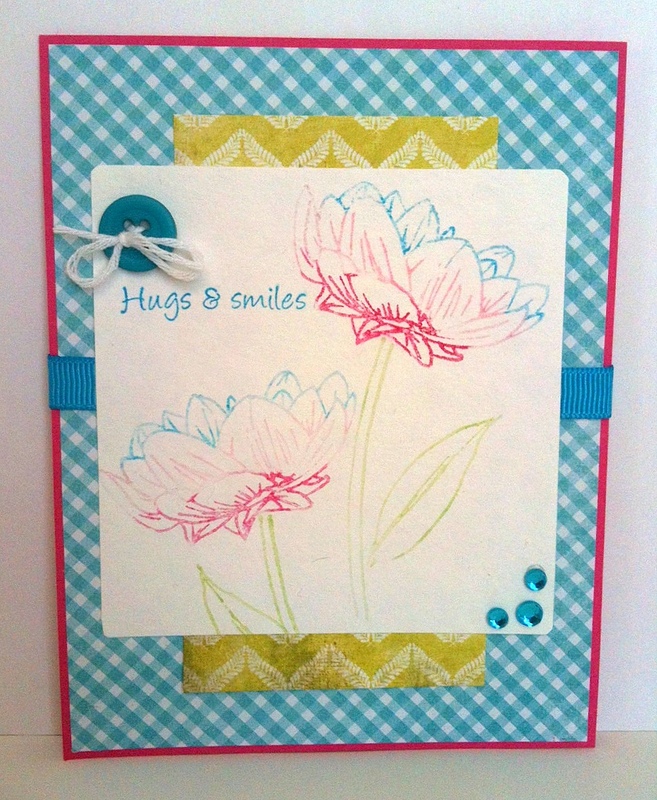 Today I’m showing a card in which I colored the stamp with Memento markers to try and achieve a watercolor effect. 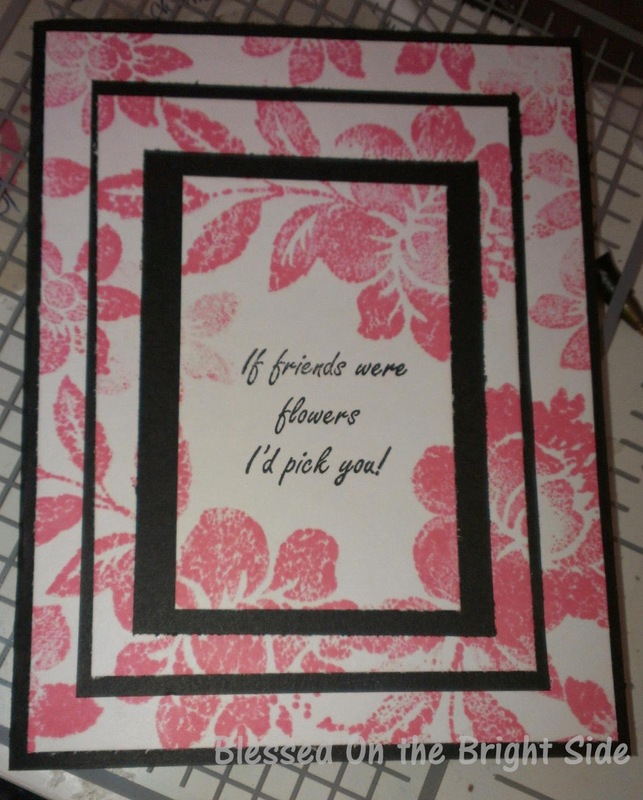 I used Gina K Designs card stock in Passionate Pink, stamps are A Year of Flowers by Melanie Muenchinger and greeting is called Tag Lines. Turquoise grosgrain ribbon is also from Gina K.
The patterned paper is from My Minds Eye, Happy Day and Authentique, Lively. Gems are from Kaiserkraft. Button and twine from my stash. By the way, I purchased the patterned paper and gems from Ribbon Carousel who is having a 40% off sale on everything in the store. Here is a link to the site, http://shop.ribboncarousel.com/. I’ll be posting again this week so watch for another crafty project. I’d love it if you’d check out my blog at http://cardsbyregina.blogspot.com. Hi everyone, I have enjoyed my week with you all. My last card for the week is a triple stamp technique card and I am not a pro at this by any means. I wanted to make a beautiful card for my aunt. We have not spoken in almost six years and I felt it was time to say I was sorry and move forward. I used a beautiful stamp set of roses. And I found a you tube video and got started. This is the You tube video by dostamping. 2 x 3 1/4, 3 x 4 1/4, and 4 x 5 1/4. Then I cut black at 2 1/4 x 3 1/2, 3 1/4 x 4 1/2, and the card base is 8 1/2 by 5 1/2. I used Tim Holtz ink and stamped the card just as it is done in the video. You will love making this kind of card. My sentiment is from CardzTV Stamps Think Spring set. I hope you enjoyed this simple card and have enjoyed our week together. I hope you will visit my blog at http://quiverofangels.blogspot.com. Hi everyone, It’s me again, Shawnee and I’m back again for my 2nd day of posting. Today is a special day for me as eight years ago I gave birth to the most beautiful baby girl after being worked up for MS. She is our joy and makes us laugh daily. She loves horses. In honor of her birthday, I headed to the Artiste cartridge and found the horses from the carousel. The base of this card is cut from Close to My Heart Art Philosophy at 5 inches. Next the horses are cut 2.36 inches in Real Dial Size. The mats are cut at 3.5 and 3.25 inches. Carleigh loves pink so the horses are pink at her request. 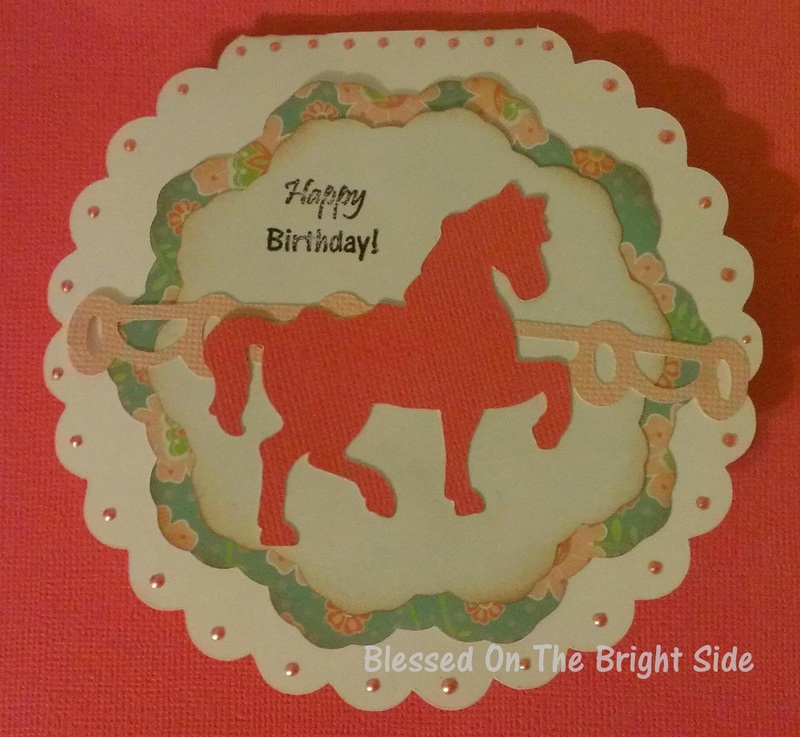 The sentiment of Happy Birthday is from CardzTV Stamps Happy Days stamp set. I accented the card with some pink liquid pearls as Carleigh loves bling like any girl. She loves her card and has it displayed in her room.